Filthy white towels lay soaked on the concrete floor. Dirty water filled the tin trough. Food crumbs were sprinkled all around the worship center. The time had come to clean up after the Jan. 10-13 Main Event Crusade at the Cowboy Church of Corsicana (CCC). Church volunteers and leaders were tired. But most would say the spiritual excitement far outweighed the physical exhaustion. "A crusade means bringing in the lost and helping them find Jesus, and that's what we hoped to do." said Derek Rogers, pastor of CCC, about the four-day event. The cowboy church, located off highway 31 in Corsicana, held its first service in 2011 with 39 members. Five years later, it has grown to see around 500 people every Sunday and has an evident "come as you are" atmosphere. On Jan. 13, the closing night of the crusade, church members willingly gave up their seats to accommodate visitors. About 1200 people packed the worship center, filling every seat and leaving standing-room only. Evangelist Ronnie Hill led the crowd in a riveting sermon about the importance of baptism, comparing to a symbol of commitment in a marriage. "Baptism doesn't save you, but it's a symbol of commitment," he said. "Baptism is the wedding ring of the Christian life." Hill highlighted baptism as an act of obedience that comes after one experiences salvation in Christ, pointing to scripture references such as Romans 6:3-5. That night, over 100 men, women and children, young and old, lined up to publicly express their salvation through baptism. One-by-one, they were immersed in water in a horse trough inside the church. 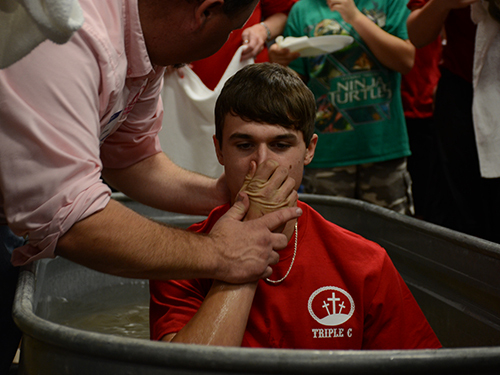 Over the course of the four nights, 251 people gave their lives to Christ and over 200 were baptized. "I just stand back in awe at God's anointing and God's moving," Rogers said about having the opportunity to baptize the new believers. "The spiritual side of me is on cloud nine while the physical side of me is worn out and exhausted. But it's well worth it." In addition to seeing lives changed for eternity, Rogers also witnessed church members experience growth. "I've watched our church members grow to a new level of their faith in Christ, and I've watched them grow in maturity," he said. "I've seen a maturity level in them that's out the roof. Their faith now is strong in knowing God can do awesome things in our church." What great things is God doing in your church? We want to know about it! Post your photos and stories on social media and tag @texasbaptists.